Quite surprisingly, cardgames often offer playing concepts which are as various as the concepts which can be found in their bigger boardgame-siblings. Leaving collectible card games with their various expansion sets apart, on the one hand the range of available cardgames comprises relatively simple trump-games like Hornochsen, whereas the dungeon-exploration game Dungeoneer, the tabletop-wargame Wings of War or the long lasting micro-management civilisation game Through the Ages mark the other, much more complex end of the spectrum. 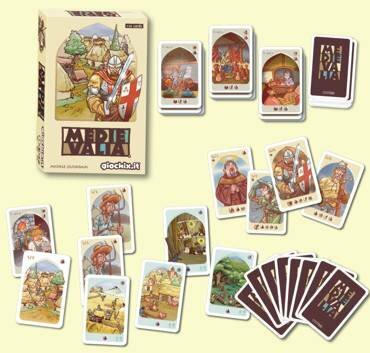 And now, the relatively small italian publisher GIOCHIX has published Medievalia, a game consisting of 110 cards which was designed by Michele Quondam and which takes the players as local Lords to warring fiefs. Considering the number of included cards and the fact that no text is printed on the cards, I did not expect the game to be very complex, and this perception was strengthened when I had a first look at the illustrated 9 pages of the rulebook. Thus, during the rules study, I was quite surprised to discover that the game in fact contained not only rules for troops and battles, but also a whole production-management-system allowing the production of resources, the hiring of troops and the acquiring of territories and buildings. The game starts with each of the two to four players having placed a City card in front of himself and being dealt a starting hand of 8 cards from the shuffled deck. The main deck in the game contains the new territories, troops and characters, whereas three additional drawing piles are placed apart to form purchase stacks for the acquirement of buildings. The first card of each of the three building stacks is revealed, so that the players always know which buildings are available at the moment. Apart from a few details on the abilities of troops and characters, all necessary information in terms of cost, productivity and battlestrength is represented either by symbols or numbers on each card, so that the whole deck of cards gets by without the need of any words on the cards. Thus, the bottom of a card shows the resources (and possible special resources) needed to play a card, the upper right corner the resource and special resource symbols produced and the upper left corner the attack/defense strength plus possibly a symbol for a special ability. As said, each player starts the game with a City territory card in front of himself, and this City card yields the player one Workforce resource which he can use once per turn. To symbolize the use of a resource, the producing card is turned over for the rest of the player's turn, so that used and unused cards can be well distinguished. A player can use his Workforce symbol to play a Territory from his hand, since all four types of territories (Fields, Piggery, Forest and Mines) just need one Workforce resource to be played. If a player adds such a card to his fief, the production yield of the new card (which is Food, Energy or Money) becomes available for the player, so that he may now use these resources in coming turns to play other types of cards. Using these four basic resources, a player can add different types of buildings to his fief or hire some cheaper characters like Farmers. Characters always may be left standing alone or with other characters (forming an Army), or they may be assigned to a territory where they can increase the production yield and defensive capabilities of the territory. Buildings on the other hand cannot stand alone, but they must be assigned to a territory. Like a character, buildings also may increase the defensive capabilities of a territory, but they also may have a production yield in resources and special resources. Standard resources of the four basic types are used normally, whereas the special resources produced by buildings may be used to play special character cards associated with the type of building. Thus, a Church enables its owner to play a Priest-character, whereas a Stable allows the playing of a Cavalry etc. It is also possible for a player to play such a character without having the needed special resource, but in this case the player will have to pay two additional Gold resources for the character. Following this mechanism, a player uses his turns to slowly increase his productivity and to recruit new characters which he may move between his territories or assign to his Army (Armies). When activating cards, for example in a territory with characters and/or buildings, it must be noted that all cards in such a stack must be activated and used at the same time, so that the full production of all these cards is triggered. Thus, there may be excess resources which are not needed for the playing of the intended card, but these resources may not be saved or used for the playing of an additional card. Direct interaction between the players starts when the players begin to move their armies away from their fiefs. With just two players, there is one empty ('intermediary') fief between the players, but with three or four players sitting around the table the all player's fiefs are separated from each neighbouring fief by an empty fief. In addition, there is an empty fief in the middle of the table, neighbouring all player fiefs. A player may move one or more of his Armies into one of the empty fiefs or an opponent's fief, and if there are either troops of an other player present or move into the same fief on a consecutive turn, a battle will occur. In a battle, the player who has moved into a fief containing opposing units will be considered the be the Attacker, whereas the player who first had troops in the fief will be the Defender. The Attacker first has to arrange all his troops in a way as to form one or more Armies of one or more characters and troops, and then the Defender will be allowed to assign all his defending troops to one or more Armies opposing the of the attacker's Armies. For each pair of attacking and defending Armies, the attack and defense strengths are calculated, with both players attacking and defending at the same time. Both players then will have to assign the hits caused by the attack of the opposing Army, so that one or more character or troop cards will have to be discarded when the defense value of the cards is surpassed by the enemy's attacking strength. A special situation may arise of the Attacker has moved to attack the home fief of an opponent, since here the owner of the fief may chose to keep some (or all) of his troops away from the battle to guard his territory. If the attacker should have one or more Armies which have not been given opposition by the Defender, the Attacker then may assign these Armies to attack territories (possibly containing troops, characters and/or buildings of the Defender). The territories and buildings either have a defense rating of their own or they may grand defending characters or troops a bonus, so that now the battle ensues between the attacking Army and the territory and its defenders. Like in normal battle, a territory or a building may be destroyed if the defense rating is too low. Depending on the composition of each player's armies, it may also be possible during a battle that the special abilities of some characters come to bear. Thus, a Priest may prevent one wound inflicted on a character or troop card either in the same or a neighbouring fief, the Bowman may make a ranged attack against an enemy character either in the same or a neighbouring fief, and an Infantry provides a +1 defense bonus to an other Infantry in the same army. However, these battle-orientated characters are not the only characters with special skills. So a Cavalry may move up to two fiefs instead of one, a Merchant can change a standard resource into another type on a 1-to-1 base (or even 1-to-2 if the starting resource is Money), the Bureaucrat reduces the building costs of a building by two resources, and the Artist doubles the production results of a group of up to three cards. The game progresses with small skirmishes and major battles ensuing between the players, and it usually continues until all but one player have been eliminated by war or siege. A victory by war means total annihilation of the other players, whereas a victory by siege means that the victorious player has armies within an other player's home fief and the other player has no armies or characters on any of his remaining territories for three consecutive turns. If these conditions cannot be met, the game ends when either the deck of cards or all three building decks have been used up, and then a victory by reputation will be won by the player with most buildings. The author especially recommends to play the game as an 'Alliance Game' with two sides composed of two players opposing each other. In this game the allied partners can help each other to some extend, and depending on the positioning of the four players around the table a 2-front-war becomes much less probable. Also, a four player game - whether played in 'Alliance Mode' or not - definately is the most interesting setting which can be chosen, because strategical options for the movement of armies increase due to the necessarily increased number if empty fiefs. As you can see Medievalia is much more than a simple "trump-and-take" style game, and to my experience it is not often that a cardgame of moderate size offers such a variety of tactical options. While playing Medievalia several rounds, I was remembered of an old, obscure friend sitting on my gamesshelf, and I went over to pick up a cardgame which should not be known to well because of its low circulation and unusual topic. The game I am talking about is Groo - The Cardgame, a game about the dumb Barbarian Groo who travels through medieval settlements and leaves havoc and disaster in his wake. In this game, the players also have the possibilities to erect buildings and rise armies, but in the end it's about having the right cards to send the imbecile Groo to destroy the other player's settlements. This element of randomised terror is totally missing in Medievalia, and it is exactly the degree of tactical planning which makes the game outstanding from many other cardgames. Of course, there still is a fraction of luck included when drawing new cards, but this typical factor in a cardgame is reduced further by the rule that unwanted cards can be sold for a resource and a new card always can be purchased for a number of resources. Also, the players have some small degree of control over their starting hands, since in their first turn they are allowed to return some cards to the bank and to receive new cards in exchange. Access to Medievalia is a bit hindered by the structuring of the rules (which are presented in Italian, English and German). The players get a clear general image of the game, but some detail questions remained unanswered during my first reading of the rules, and although a second reading and one or two referrals to the other language translations of the rules cleared a lot of things up, some minor points remained for which I could find no direct answer. Thus, the question whether newly built cards may be used the turn they have been built, the resetting of used cards, the distribution of hits in a battle or the definition of who becomes the "attacker" had to be deducted from the general playing principles and a given example. Here, the FAQ on the GIOCHIX-website also is quite helpful, since it also answers some of the questions to situations which might arise during the game. In the end, there are quite a few small twists in the rules which make the game not easy to explain to a playing group, so that some kind of overview sheet would have been a handy gaming help. Once these initial hurdles have been overcome, the game progresses rather smoothly and I had more then one round where the players longed to continue playing once the cards were used up and a reputation victory was at hand. However, there are not enough cards included in the game to make a prolongation really reasonable, and although I though about the possibilities which might be opened by adding cards of a second game, I quickly dismissed the idea because I decided that this would not really be an improvement. The players would amass a huge fief with lots of units which would lead to a stalemate with nobody risking an attack, and this would be contrary to the game's spirit since to some degree it lives from its restricted duration because interaction is forced upon the players at an early stage. A factor I really liked about Medievalia is the general absence of text on the cards which keeps the layout easily accessible and makes the game progress very fluently, and also players from different countries can use the same set of cards without any translation difficulties. Considering the unusual rules and setting, the nice graphical design and the moderate price of a cardgame, Medievalia for me is a game I recommend to have a closer look at. And the bit of time players will have to spend to fully understand the rules will be well awarded once the game has started.